For over 75 years, May has been designated as Better Hearing and Speech Month — a time to raise public awareness, knowledge, and understanding of the various forms of communication impairments to include those of hearing, speech, language, and voice. Helen Keller once noted that of all her impairments, she was perhaps troubled most by her lack of speech and hearing. She elaborated that while blindness separated her from things, her lack of speech and hearing separated her from people — the human connection of communication. 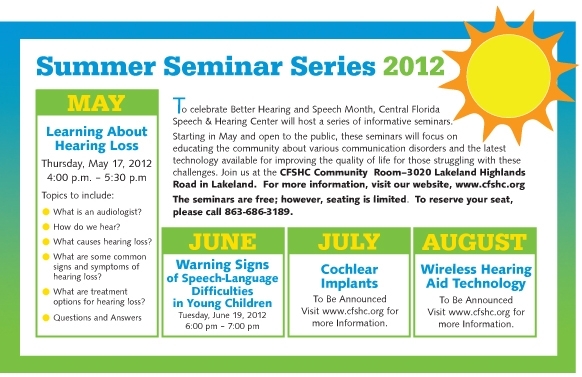 During the month of May, Central Florida Speech and Hearing Center will host a variety of activities and events to promote public awareness and educate our community about these communication disorders and how the latest technology can bridge the gap for those faced with these challenges.